Right now entire Kashmir is virtually burning. 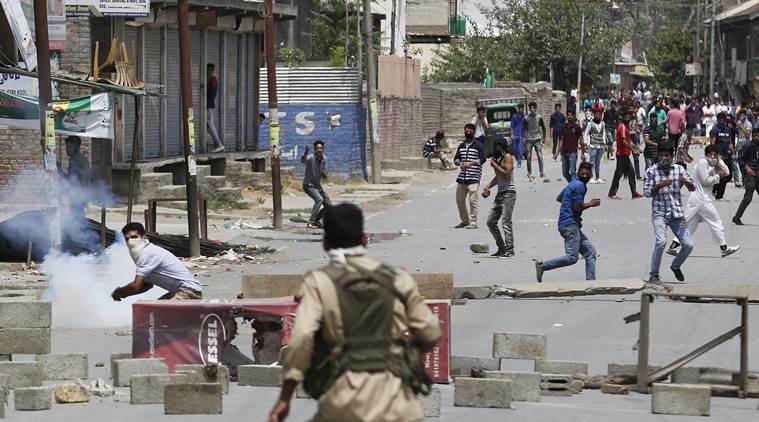 According to reports, over a dozen and a half youth have been shot dead and there are hundreds of persons with bullet injuries in different hospitals all over Kashmir. The Divisional Commissioner has declared that the curfew in entire valley will continue for the time being. In spite of curfew and deployment of additional forces, the situation does not seem to be cooling down. The young Burhan represented a phenomenon which by his killing instead of dying down, maygrowgeometrically. The phenomenon is defiance of an oppressive and humiliating authority. Kashmiris have been oppressed, degraded, humiliated by outside oppressors for centuries. There have been many uprisings in the past but these were harshly put down. Most of the time, Kashmiris have been following the maxim, “Join them, if you can’t beat them”! They have preferred to remain quiet for their very survival. However, in the history of every nation there comes a time when its young men prefer death to humiliation. Burhan is the latest example of that phenomenon. After having his family humiliated and oppressed umpteen times and losing a brother and many relatives to alleged security forces excesses, he decided to take the revenge. The result was the new wave of militancy led by him. He became a symbol and an inspiration to the youth for standing up to oppression instead of living as a humiliated human being. This inspiration appears to be highly infectious and is spreading fast among the new generation. It has been admitted by top security officials that the local militants these days disproportionately outnumber the foreign militants. The militancy is fast becoming a local phenomenon. Even in the present turmoil a number of police stations have been attacked and arms looted in some cases. It is also reported that some constables have run away with their weapons. In spite of a total blackout of internet and other communication services, the news is going all over the world. The so called popular leaders have become irrelevant in the present turmoil led by the new generation of Kashmiris born and brought up in the conflict of last two decades. The most difficult movement to suppress is the one led by an inspiration and ideology especially that of a martyr! It needs no leaders but followers only. In the past, the spark in Kashmir has always ignited fires all over the sub-continent. It is a very precarious and volatile situation. The saner elements not only in India but in the entire sub-continent need to stand up and take immediate steps to douse the flames by recognizing the existence of the oppression being inflicted on the new generation of Kashmiris. Free expression and dialogue is the only way to arrest the Tsunami. In the alternative, it may ultimately engulf not only the sub-continent but the entire South Asia. It is pretty silly of the writer to term this as a ‘tsunami’ , its nothing more than storm in a tea cup called Kashmir. India has weathered many such storms and I am sure this too shall pass. WRT “Kashmiris have been oppressed, degraded, humiliated by outside oppressors for centuries. ” is completely not correct as per documented history. Kashmiris on Indian side have willingly participated in democracy for many decades now. They have been “ruled” by their own elected representatives. Deny till the cows come home but truth won’t change this fact. Further the writer says ” its young men prefer death to humiliation”. This too is also a sweeping generalization, clearly writer has NO idea at all on real wishes and aspirations of the youth of the valley. I wonder IF the writer is informed about the IIT aspirants or Kashmiris who have passed IAS exams and some are in the topper’s list?!! This statement too is outright lie @ “It has been admitted by top security officials that the local militants these days disproportionately outnumber the foreign militants.” No such statement by anyone at all. IMHO, Kashmiris are quite fine being with India. A few reluctant people raise their ugly aspirations every now and then and push people and administration to violence. For nearly 70 years, it has achieved nothing and won’t achieve anything further except bring grief and strife to the people of Kashmir. Just because a few thousand people showed sympathy by attending the funeral does NOT imply their support for violence and militancy. The real support by Kashmiris is for democracy in which they participated willingly and happily. Some idiots like this writer wants to deny that truth but surely they’d fall flat on their faces. Well Said, Maya… And also, one should always look back on kashmeeri pandiths.If any one want to start commenting on the present situation of Kashmir then please do so from past. You seem to be living in a Cuckoo’s world. Better have the courage to visit any part of the valley now. The death toll has reached 30! Hahagahahahagaha. Ahaas . It appears Maya being ignorant and living in fools paradise term the existing crisis as storm in a tea cup. I think maya shall turn the pages of the history but resl one not distorted and the start debating. Mr Ashrah has rightly terned the grave crisis as tsunami i think the most proper word would be Dooms Day. Yeah it is really dooms day so far as the crisis following the killings are going on. Maya perspective is like a bird hides its head in the bushes but the hunter strikes hisbidy.